What sort of tools can I use to make such a script? If you don't know, please forward my question on to everyone you know. It's very important. It probably involves President Obama and/or dead babies. Hi, Python students from Saturday! Hope you enjoyed the class, and thanks for your patience as we struggled with wireless issues. Here's the updated class materials I promised - if you can, install Visual Python on your machine and try out some of the suggestions given in the comments at the bottom of move.py and gravity.py. I'm very fortunate to be able to go to PyCon this year, and I plan to come to the Dayton Dynamic Languages meeting the following Wednesday (March 14) bubbling over with stuff I learn there - I'd love to see you there! Bring whatever Python project you've been working on and we'll help push you over any bumps you've hit, or strategize on ideas for new projects. When I teach Python, I usually include a slide or two about Python's importance and growth. At this point, that's begun to feel unnecessary - but I think I will include this illustration, because it's a neat one. In 2004, I'd just started looking at Python. When I found out that PyCon would be just a few miles from my sister-in-law's house, I thought, "Why not?" - and I fell in love with the Python community forever. 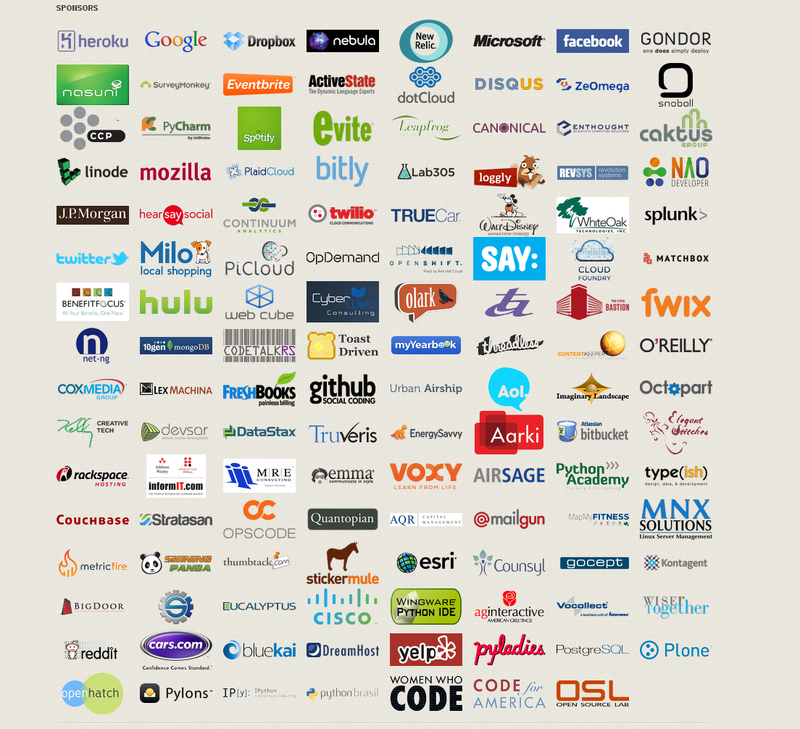 PyCon 2004 had nine sponsors. This year, I barely squeaked my registration in before the blast doors slammed shut. 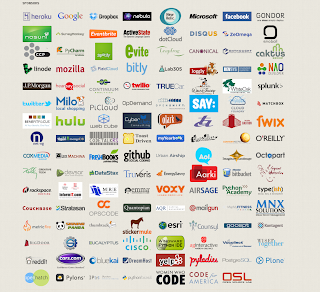 Here are PyCon US 2012's sponsors. This Saturday (Feb 18, 2012), Sinclair Community College in Dayton will host Python: Programming is Fun Again, a two-hour introduction to the language. It's a hands-on workshop, so bring a laptop if you can. I'm teaching, so you can expect some planets to collide. However, this time, the aim is to help you get your own feet wet in actual programming. We'll start with simple 3-D graphical scenarios, and students will decide how to tweak and evolve the programs from there. Contact Dr. Shirley Stallworth (shirley.stallworth@sinclair.edu) to register and for detailed directions and parking information. Afterward, you can stop by TechFest, also running at Sinclair!